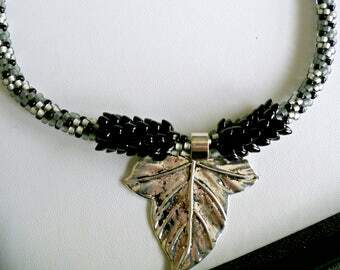 One of a Kind Jewelry That Makes A Statement! Iridescent green Kumihimo necklace with gold accents, statement necklace, anniversary/birthday gift, "Green Dragon"
Announcement Welcome to The Beckoning Cat -Jewelry that makes a statement - YOUR Statement! MOTHER'S DAY IS MAY 12! Are you ready with a one-of-a-kind gift for that special Mom or Mom-to-be? DO YOU HAVE AN UPCOMING BIRTHDAY? ANNIVERSARY? WEDDING? BRIDAL SHOWER? HOW ABOUT "JUST BECAUSE"? 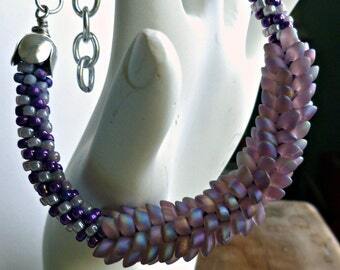 Check out my bead weaving bracelets and more chainmaille style necklaces and bracelets. 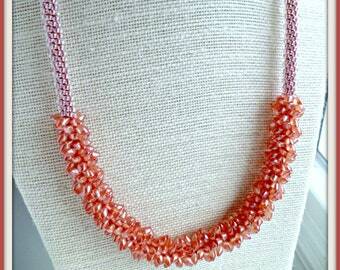 New beaded Kumihimo jewelry pieces are added all the time. Everything in my shop is Ready to Ship! 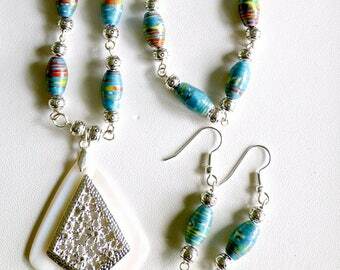 I offer other types of gemstone, Swarovski, paper bead and wire jewelry as well, so please look around my shop. 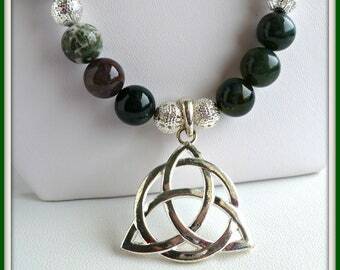 All of my jewelry pieces are original and one of a kind, Nothing is mass produced. I only use quality materials with all of my jewelry since I only make what I would be proud to wear myself. CUSTOM ORDERS WELCOME! Welcome to The Beckoning Cat -Jewelry that makes a statement - YOUR Statement! Beaded Kumihimo cluster necklace with amber & off white dragons teeth, statement necklace, "Dragon Freckles"
Beaded Kumihimo Fringe Necklace, bead necklace, Mothers Day gifts, statement necklace "Midnight at the Oasis"
Festive, mardi gras colored beaded Kumihimo necklace, statement necklace, girlfriend wife gift, seed bead necklace, "Festival"
Sunny yellow dragons teeth beaded Kumihimo necklace, statement necklace, birthday anniversary gift, girlfriend wife gift, "Sunshine"
I bought this to go with my Easter outfit and it is perfect. Can't wait to wear it. 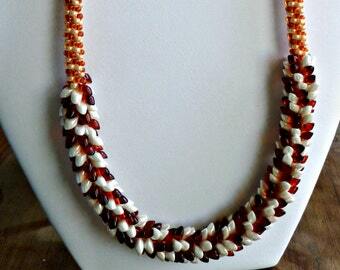 Caribbean Lagoon - the multi-color Miyuki glass seed beads reflect the clear blue waters of the Caribbean. Dragons teeth bracelet - unique texture and 3D color effect - still flexible and comfortable to wear. Closer look at the Kumihimo process. Insert one bead at a time into the braiding process. Cannot be done watching TV. Craft Addict Breaks Into Jewelry! It all started at a neighborhood ladies night out when the hostess presented all her guests with a very simple beaded bracelet. That motivated me to learn yet another craft technique - jewelry making. I found a local bead store that provided beginner lessons and made my first pair of earrings. That was all it took to galvanize me into remaking a necklace that my mother had given me (costume jewelry) to play dress up with as a child. 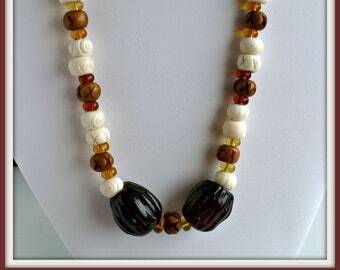 Over time, the necklace had broken but I kept the beads. I was able to redesign the necklace to make it more current and wear it all the time now. Why the name "The Beckoning Cat"? The name "beckoning cat" or "maneki neko" comes from a Chinese/Japanese folktale about a wealthy feudal lord who was taking shelter under a tree near a temple during a thunderstorm. The lord saw the temple priest's cat sitting on the front step of the temple beckoning to him and followed; a moment later the tree was struck by lightning. The wealthy man became friends with the poor priest and the temple became prosperous (thanks to Wikipedia for the basic info). Just a symbol of good luck/good fortune. My motto for life is "You never stop learning" so I always look forward to learning new techniques and grow as a crafter and a person. I am one of those "crafty" people who has dabbled in a number of crafts & techniques over the course of time. I started out w/sewing, taught myself crochet & knitting, did crewel embroidery. My latest addiction is jewelry making & I love it! My husband has lived thru my various craft stages. Currently he advises me on how to pack my stuff more efficiently & helps lug my stuff to local craft shows. He actually enjoys participating in these events. Can't live without him. Find TheBeckoningCat at the following upcoming markets!